The Tank Landing Ship, or more properly, the Landing Ship, Tank (LST), is the type of vessel created in World War II to support amphibious operations with the carriage of vehicles (most especially armoured vehicles), cargo and troops to be landed directly onto an unimproved shore. The British ‘Dynamo’ evacuation from Dunkirk in June 1940 forcefully demonstrated to the Admiralty, although in a reverse of the demand which then emerged, that the British needed ocean-going and therefore comparatively large ships able to handle the shore-to-shore delivery of tanks and other vehicles in amphibious assaults upon the continent of Europe. 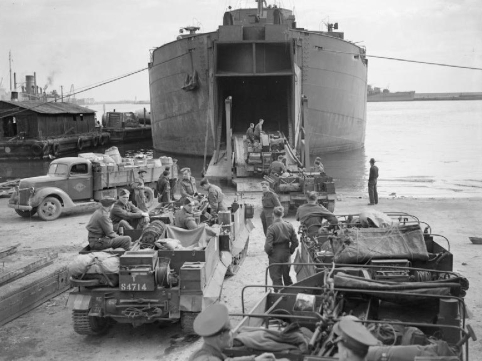 Although tank landing craft (LCT) designs and a prototype were completed during the winter of 1940/41, Prime Minister Winston Churchill demanded ships that could land the heavy tanks which were to be built during 1941 and put them ashore anywhere in the world. This last meant that the new vessels had to be fast enough to allow them to steam in convoy, which demanded that the new vessels would need a ship’s bow. This also meant that there would also be a gap between the beached ship’s bow ramp and water shallow enough for the embarked tanks to wade ashore. In addition to these design problems was the difficulty of finding British yards with the capacity to build such ships, and the problem of providing for the ship’s survival on a fire-swept assault beach. This was the most taxing aspect of the entire concept, for ships of the size envisaged would take several hours to discharge bulk cargoes, and would need at least 45 minutes to land a full load of vehicles. During this time the ship might be savaged by enemy fire, or merely be left standard as a result of missing the tide. Ultimately these fears were not realised, largely as a result of the Allies’ overwhelming air superiority, but some LSTs did remain fast on a beach longer than had been intended despite the adoption of many means to speed the unloading process. 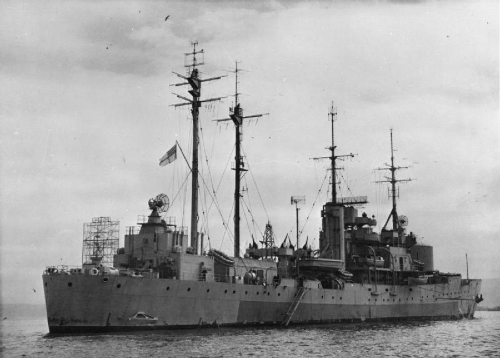 As a stop-gap measure to meet Churchill’s demands, pending the design and construction of dedicated LSTs, the Admiralty found that there were three shallow-draught oilers, Misoa, Tasajero and Bachequero, built to cross the shallow bar of the harbour of Maracaibo in Venezuela. The Greenwell yard of Sunderland undertook the task of effecting a conversion of the 4,890-ton Misoa, completed in July 1941 as the world’s first LST. The ship had a double ramp arrangement designed by the Department of Naval Construction and developed by the Clarke Chapman company: this ramp had an effective length of 100 ft (30.48 m) and extended through double-flap bow doors hinged at their base. On a beach with a 1/35 gradient and a forward draught of 4 ft (1.22 m), the converted ship could land a 40-ton tank across the retractable causeway, which was 8 ft (2.44 m) wide. The ship carried a maximum load of 18 Churchill infantry tanks, or between 22 and 25 smaller tanks or 33 trucks in rows on the turret deck above the oil tank spaces, which had been adapted for accommodation and the installation of large ballast water tanks. The ship’s sides were extended above the turret deck and a new deck was added to protect the tank cargo, which was carried in an enclosed volume which featured special ventilation. Trials confirmed that ships of Misoa’s size could be kedged off a beach, and although the ship was more a proof-of-concept vessel rather than a prototype for purpose-built LSTs, the Department of Naval Construction gained invaluable experience in several aspects of landing tanks and other vehicles on beaches. The Bachequero was a sister ship of Misoa, both having a length of 382 ft 6 in (116.59 m) and beam of 64 ft 0 in (19.51 m). The 3,952-ton Tasajero was slightly smaller, with a length of 365 ft 0 in (111.25 m) and beam of 60 ft 2 in (18.34 m), but could carry almost the same cargo. Each of the three ships carried two mechanised landing craft (LCMs), had two 50-ton derricks and carried an armament of three 2-pdr ‘pom-pom’ guns, six 20-mm Oerlikon cannon (later increased in number to between 11 and 26), two 4-in (102-mm) smoke mortars and two 0.303-in (7.7-mm) Lewis guns. There was accommodation for tank crews or other army drivers (between 192 and 207 men), or 98 combined operations personnel, as well as the ship’s complement of 83. The speed of between 8.25 kt and 10 kt on the 3,000 shp (2237 kW) provided to two shafts by reciprocating steam engines was deemed too slow for the ships to make passage with transport convoys but the limitation had to be accepted in these first LST attempts, though the three ships of the ‘Boxer’ class, which was the first purpose-built British LST type, were designed for 18.5 kt at beaching draught on the 7,000 shp (5219 kW) delivered to two shafts by steam turbines. The ‘Boxer’ class ships benefited from the DNC’s careful consideration about the design of a ramp capable of extending across a 100-ft (30.48-m) gap to very shallow water from a bow drawing 5 ft 6 in (1.68 m) on a 1/35 beach. Though mechanically complex, the solution finally developed by Stothert & Pitt of Bath was a double-cantilever ramp with a 71-ft (21.64-m) main section and a 54-ft (16.46-m) forward extension. The folding ramp occupied a considerable part of the tank deck’s forward area on these vessels. 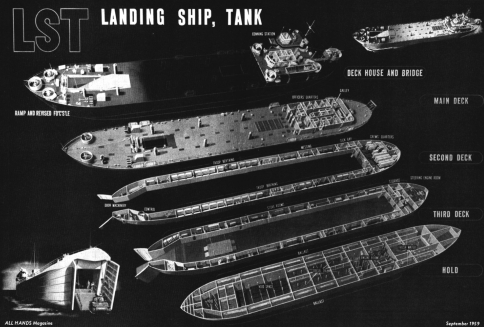 The vehicle deck was retained for later LST designs, and extended along almost the full length of the ship. Vehicles could also be carried on the upper deck, from which they were lowered to the tank deck by lift, and along either side of the upper deck were the accommodation spaces for 193 army personnel and the ship’s complement of 169. The two sets of boilers and turbines were installed just abaft the centre section, and the funnel offset to starboard to provide the deck area for a 40-ton crane. The design also included side ports which permitted the offloading of vehicles into LCMs, ventilation of the type used on the Maracaibo conversions with exhaust trunks joined by flexible connections to the embarked vehicles’ exhausts and, most far-sightedly, features to facilitate the carriage of crated aircraft. There was one 40-ton crane. The three ‘Boxer’ class LSTs were Boxer, Bruizer and Thruster, of which the first was ordered in January 1941 from Harland & Wolff of Belfast, which in fact built all three vessels. Harland & Wolff had been involved in the project from an early stage, and it was this company’s suggestion to use a pair of vertical bow doors. The teething problems of the ramp/causeway in the shallow-draught hull, other design innovations and the damage caused by German air raids resulted in the first ship being launched early in 1943. The design was not suitable for mass production and had too great a draught to beach in shallow water, however, the dedicated LST role was assumed by the LST Mk 2. The three vessels were converted to other uses, Boxer being adapted in 1944 as a fighter direction ship with a longer ship’s bow and extending radar antennae. The data for the LST Mk 1 included a displacement of 3,620 tons standard and 5,410 tons full load, length of 400 ft 0 in (121.92 m), beam of 49 ft 0 in (14.94 m), draught of 14 ft 6 in (4.42 m) standard and 18 ft 5 in (5.61 m) deep load, declining to 5 ft 0 in (1.52 m) forward and 13 ft 0 in (3.96 m) aft for beaching, propulsion by two Foster Wheeler boilers supplying steam to two Parsons geared turbines, 1,728 tons of fuel oil, range of 10,355 miles (16665 km) at 14 kt, capacity of 13 Churchill tanks or 25 medium tanks on the tank deck, 27 3-ton trucks on the upper deck and 193 army personnel, complement of 169 men, and armament of four 2-pdr ‘pom-pom’ guns, eight 20-mm Oerlikon cannon, and two 4-in (102-mm) smoke mortars.